Recently the WA State Employment Security Department and other local economic development organizations, was awarded a sizeable National Emergency Grant in the amount of $4.8 million dollars though the Department of Labor, which made the grant available as a result of the Base Realignment and Closure action which began in 2005. The majority of the grant will help 825 displaced military spouses who relocated to Joint Base Lewis-McChord (JBLM) with their husbands or wives to find work and start new careers in Pierce and Thurston Counties. Provided services will include career coaching, job training, support services and employment linkage. A portion of the funds will also be utilized to assist in identifying skill gaps in new and emerging industries critical to the economic growth of both counties surrounding the base. The program, which will be run on a local level by WorkForce Central, the workforce investment board for Pierce County, and the Pacific Mountain Workforce Development Council and the workforce investment board for Thurston County, is on track to enroll 825 individuals over the summer. On Sunday, October 16, the Ranger and NW Airlifter newspapers will host another FREE event for local military...but this one is specifically for the children. A Salute to the Unsung Heroes will honor the children of military, many of whom have spent years of their young lives with an absent parent due to routine deployments. "We feel that the children of military sacrifice so much and they really have no choice in the matter," said publisher Ken Swarner. "Its time to honor them." "The goal is to throw a big party for these kids," he said. "And show them we appreciate what they give up." Luckily since the event will once again be held at the St. Martin's University Pavilion, 5300 Pacific Avenue SE in Lacey, there will be enough room to accommodate the festivities. The event will feature gaming stations, free pizza and other kid-centric activities and attractions. Military ID will be required at the door for entry but there is no admission and everything inside will be free to the families and children. Sponsors are still being recruited for the event and they are looking for kid-friendly organizations and businesses that want to come out and show their support, from food vendors to entertainers, as well as those willing to donate prizes and give-a-ways. Interested sponsors or volunteers should send an email to Swarner atpublisher@ftlewisranger.com. Remember, spots are limited and those who are donating can be at the event at no cost. Stay tuned for updates and event signups later this summer on www.northwestmilitary.com. Look above and you'll see a couple new pages to this site. In our efforts to help local military spouses, we have started two sites for job searching and home based businesses. We hope these provide the assistance our local military spouses need to get a job and/or grow their home based businesses. If you are an employer, please consider participating in our work by recommending jobs and othe ropportunities. Send your contributions here. 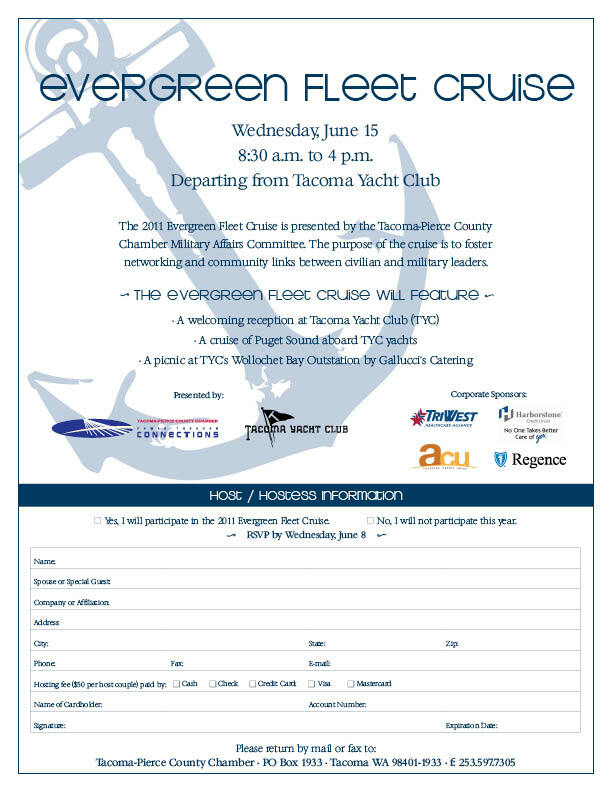 From the Tacoma Chamber...You and your special guest (spouse, significant other, associate) are cordially invited to host the Chamber’s annual Evergreen Fleet Cruise, June 15, sponsored by America’s Credit Union, Harborstone Credit Union, Regence and TriWest Healthcare Alliance. The purpose of the Evergreen Fleet Cruise is to foster networking and community links between civilian and military leaders. The Cruise, presented by the Chamber’s Military Affairs Committee, in collaboration with the Tacoma Yacht Club, is a cruise of Puget Sound aboard private yachts and a picnic at the Club’s Wollochet Bay Outstation.This year will again feature a welcoming reception. The purpose of this reception is to afford participants an opportunity to meet in a comfortable atmosphere prior to beginning the Cruise by 10:00 a.m. The reception will be between 8:30 a.m. and 10:00.m. at the Tacoma Yacht Club. Arrival time at the reception is permitted to be variable. Yachts will depart no later than 10:00 a.m.Please refer to the enclosed invitation for more information. The Chamber wishes to have all participants confirmed by June 6nd. Please consider, call Gary Brackett, at 253/627-2175. Early last year, the Captain Meriwether Lewis Chapter of the Association of the United States Army (AUSA) announced that it would be expanding its reach by forming five satellite subchapters in the towns and cities surrounding Joint Base Lewis-McChord. At the time, the main chapter had 1,200 members and was growing, so the hope was that the subchapters would help to educate the public on a more local level about the Army and then consistently garner support for those serving in uniform. Ken Swarner, who publishes the Ranger newspaper, has resided in DuPont for 13 years and was happy to take the reins as the president of the DuPont subchapter. "DuPont is the gateway to Ft Lewis, so it was a logical place to launch a subchapter," said Steilacoom resident Denise Dhane, who is serving as the subchapter's vice president and co-owns Dhane Orthodontics in DuPont. "This community has stuck by these troops through thick and thin, and I know they will continue to," she said with a smile, alluding to the Operation Make a Soldier Smile organization, which she founded. "Its like our subchapter has been around doing this job for years now!" Sorry for the commercial message here, but we've had a few requests for info about this year's Rodeo competition at McChord. Yes, you can place "Go Team McChord" ads of support in the Rodeo Guide which we publish (in mid-July), which is distributed inside the NW Airlifter newspaper at McChord, as well as at certain Rodeo events and in the local hotels. The Airmen at McChord appreciate the support - they love to see how the local community is pulling for them during this international competition. Your support ad reflects well on you, the command and the community. To learn more about Rodeo, click here. To place a support ad, call (253) 584-1212. Want to be on the ground floor of supporting a DuPont organization that is turing heads, doing great work, and fast gaining national attention? Wear Blue: run to remember has been written up in Runner's Magazine, the LA Times, and soon to be featured on NPR and in the News Tribune. A documentary is in the works, and the folks at NIKE have taken a liking to them. Run to remember helps spouses and soldiers process their grief of a troop killed in action through running. They meet every Saturday, 9 a.m. in DuPont's Powderworks Park. Currently the group is preparing for the Seattle Rock and Roll marathon. Dhane Orthodontics in DuPont has stepped up to provide 3-4 buses to take participants and supporters to the June 25th race. But more needs to be done. The group needs more folks to sign up to support the race. The group will man a mile of the course to wave flags, and hand out water and snacks to the racers. They also are looking for a group to provide 150 lunches that day to the supporters. And, for the group's kick-off dinner June 24th, they need a cake to feed 200 people. If you can help, please call Ken Swarner at (253) 584-1212. For more information about the group, see the following story HERE. A recent study of Army and Air Force Exchange Service prices shows that troops save an average of 24 percent when exercising their AAFES benefit. Conducted in October 2010 by an independent research firm, the Market Basket Survey focused on the percentage of savings military patrons receive based on market, retailer and department. There’s plenty of work to be found at Joint Base Lewis McChord — and the military is more than willing to help local businesses get it. The more than 55,000 soldiers who populate JBLM need restaurant, cleaning, car wash, pet care and other services. There are buildings to be constructed and others in need of massive renovation. Office and recreational facilities need to be expanded. So, with millions of dollars in potential federal contracts, JBLM staff are putting out the word that, although it’s all up for grabs by anyone, they prefer doing business locally. And they’re providing a wealth of resources to match-make between base contracts and companies in the South Sound.